A mixed-doubles performance of swirling driving pleasure: Photographer and Curves mastermind Stefan Bogner takes a trip with a very special twist. Snow crunches under the winter tyres; the sound is like glass splintering. Slowly and tentatively, the wheels of two vehicles roll onto the frozen lake of St. Moritz: a Porsche 911 ST rally vehicle from the 1970s, closely followed by the latest GT2 RS. Both vehicles represent the peak performance of their respective eras. In the seventies, the 911 ST was super lightweight, a radical racing machine, a full-throttle experience. Today’s GT2 RS is a high-tech virtuoso, taking a trip into the parallel world of what is feasible, an explosion of contradictions. So what do they have in common? Their analytical appeal and robust functionality. Pure emotion comes next, when the driving begins. It’s time. With a couple of short bursts on the throttle the ST glides off, as if it was made to conquer the slippery surface. The rear swerves out gently, nudging the rally classic into a drawn-out drift. Rapid gear changes keep the movement as consistent as possible, and the vehicle well under control. It’s impressive how spontaneously and precisely the seasoned 2.3-litre flat engine responds to the driver’s acceleration demands, making it possible to control the vehicle’s path with the accelerator pedal. The steering wheel becomes something of a balancing pole for easing the 911 ST from side to side with the gentlest of movements. No force is necessary; the weather conditions remain sufficiently cool and at the same time terrifically fast. This vehicle is in its element. Still well behind, the GT2 RS appears to hesitate, considering whether demonstrating its power with full snow cover is really such a good idea. But perhaps the newcomer is also nervous because the older 911 practically oozes self-confidence: The old ST looks extraordinarily confident and playful as we watch it create glittering cascades of snow, enjoying every opportunity to show what it can do. 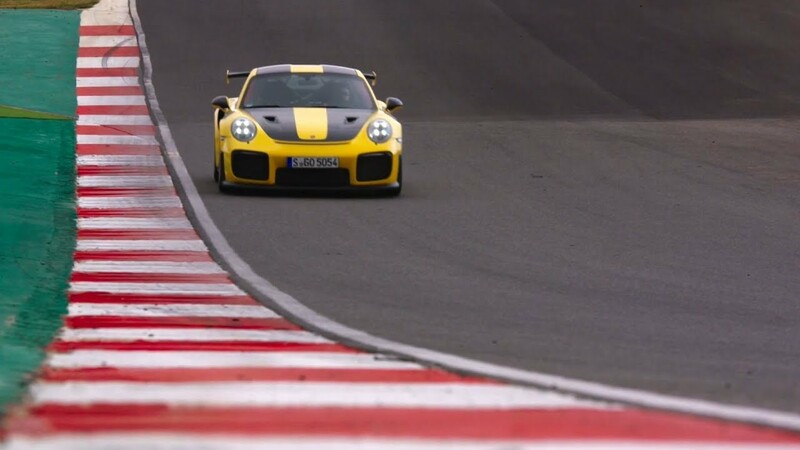 At this moment, the fact that it is newer, more advanced and more modern does not mean that the new GT2 RS has an advantage. It needs to get out there and prove itself. It’s time to show what it’s made of. A second is all it takes to see that this GT2 RS is by no means a clumsy brute on the ice. Its immense engine power is controlled with precision, the steering is razor sharp, the balance is perfect. As the vehicles move together, the whole of St. Moritz can gaze down in wonder at this ice ballet on the frozen lake, admiring this mixed-doubles performance of swirling driving pleasure. The heat from the engines shimmers in the ice-cold mountain air and an almost magical layer of glittering ice crystals settles on the wheels and bodies. We roll off the lake and onto the road, heading north east on the main route before taking the next exit to the Bernina Pass. It’s hard to believe just how confidently the Porsche 911 GT2 RS now storms across the pass. Tackling the sloping roads of the mountain pass in sweeping turns, the vehicle kicks up spray as it thunders through the melt water streams on the road, shooting moisture into the air to create instant rainbows in the glistening sunshine. It plunges deep into the hairpin bends, snorting with the exhalation of the turbocharger, steam rising from its nostrils. Accelerating is effortless, with a feeling of weightlessness that you would only otherwise experience when dreaming of flying – this is it. The PDK transmission clicks effortlessly into the appropriate gears, converting the immense engine power into an endless arc of non-stop suspense. The traction is incredible – even in these conditions. Crossing salt and grit, wet roads and ice, the GT2 RS conquers the mountain pass like a powerful, full-blooded beast. Following behind, the old ST takes on its own race in a wonderfully symmetrical rhythm. Switching gears with some lively throttle blipping, the growl of the flat engine echoes all around the snow-covered slopes. The ST is different to its brother – younger by several decades, more complex to drive, a little rough around the edges perhaps – but wonderfully intense. Eventually we reach the top of the pass, pausing for a moment between the high snow banks to the left and right-hand side of the road to squint into the glaring white and blue wilderness that surrounds us. We take in the feeling of the crisp cold on our faces. But then the wide auxiliary headlights on the 911 ST appear to wink at us, encouraging us to continue up into the darkness of the mountains for the couple of hours left in the day. And that is exactly what we do. As an extra bonus, Stefan Bogner and his team were able to revive the legendary art of “Skijöring”. You can find out more at www.curves-magazin.com. Mobile racing game CSR Racing 2 and Porsche celebrate 70 Years of iconic cars with an exclusive video series.